This is the ideal entry for the ZenKimchi Food Journal. 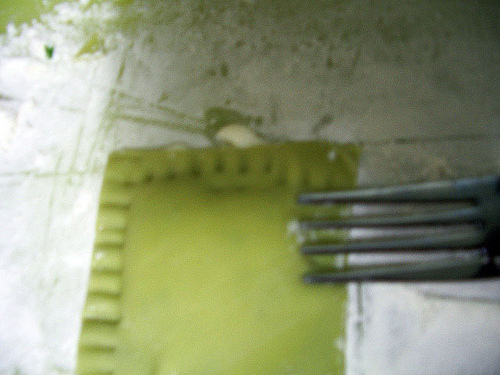 In fact, part of this dish was the inspiration for the journal itself. 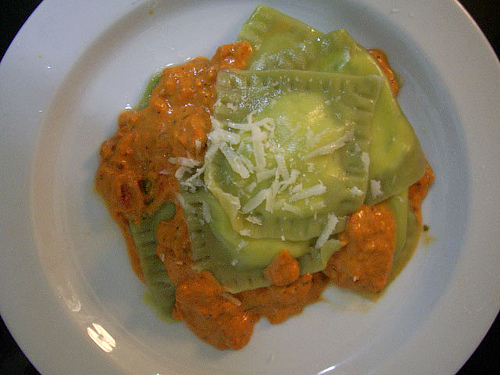 It’s about creating Western food using ingredients found in Korea (the ravioli). It’s about easily making from scratch something you used to just buy at home (the cheese). It’s about combining, dare a say, fusing, Korean and Western foods. This started out from my first months in Korea where I was craving my brother’s (an up-and-coming Italian and Spanish chef in Atlanta) vodka sauce. I didn’t have vodka on hand at the time, but I did have lots of soju — 1,000 ($1) a bottle, may I add. I said, “Why not,” and made a dish that actually rivaled any vodka sauce I’ve ever had in the past. This brings me to another tangent. It is traditional in so many cultures to cook with alcohol. I have yet to find this application used much in Korea. The only place I’ve seen soju used in cooking was at the chitlin’ restaurant in Ansan. I personally sneak a shot or two of soju in my kimchi jjigae when Eun Jeong’s not looking. If so many cultures successfully use alcohol in their cuisine, there have to be applications in Korean cuisine. Yet that’s another road I have hardly traveled. If you live in Korea, I think this is the ultimate dish to impress your significant other–or someone whom you’d like to be your significant other. Maybe I should have waited until Valentine’s to post, but I’ve been waiting long enough. This gives you enough time to plan. Remember the easy mock ricotta you can make at home? 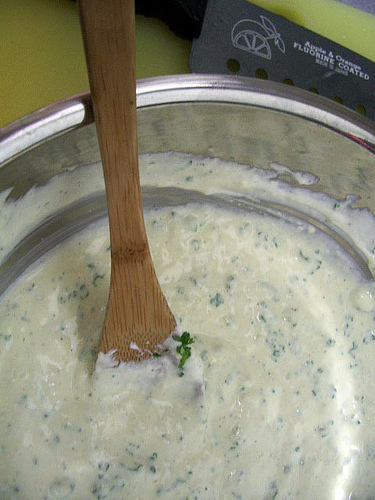 Get a good bit of that in a bowl and blend it with an egg, some finely chopped parsley, and a little bit of salt and pepper. 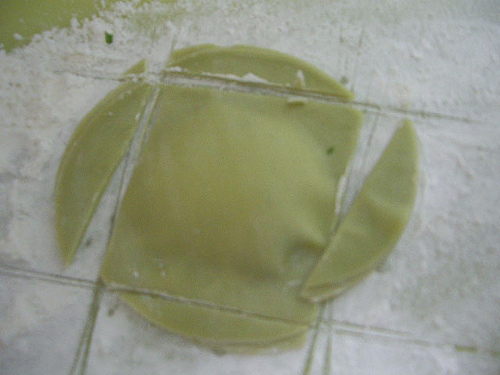 The wrappers are basic mandu wrappers. 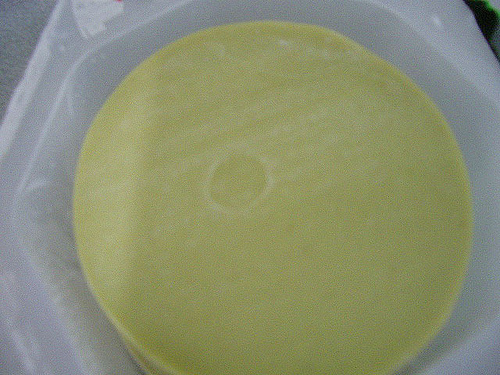 In this case, I used some dyed with green tea. See? These little things are in the freezer section of any little mini ajossi mart. Flour a surface. These buggers are sticky. 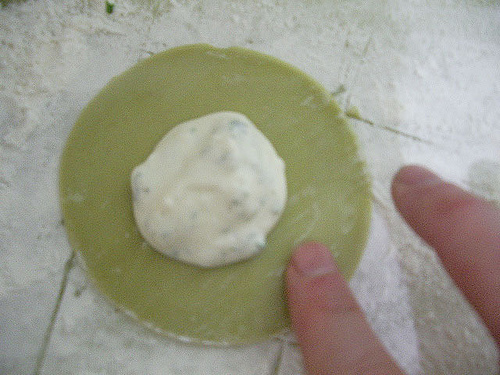 Place a small–a small–dollop of cheese filling in the center of the wrapper. Wet your index finger in a bowl of water and rub it around the edges of the wrapper. Put another wrapper on top. 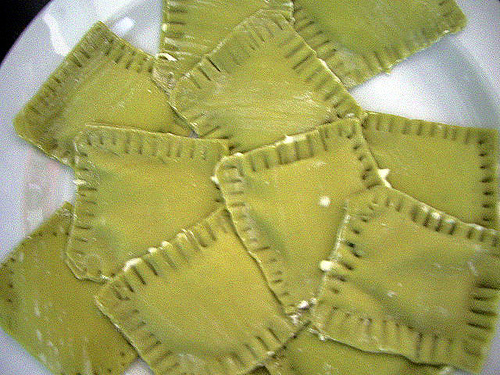 Now it’s time to make it look more like ravioli. What I did was cut off the rounded bits so that it looked more square like. 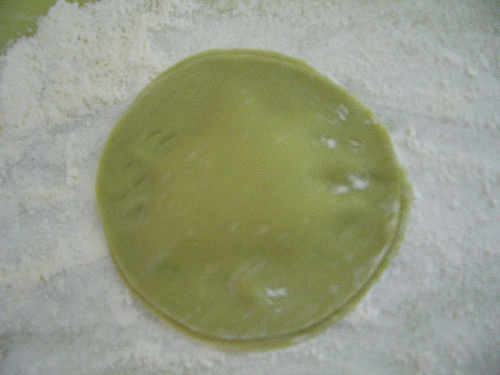 I then pressed down the sides with a fork to give them that ravioli cutter look. This also helped seal them. It takes a while, but it’s worth the work. Remember–only a dollop of cheese filling. You can see a few of mine had spewed out. 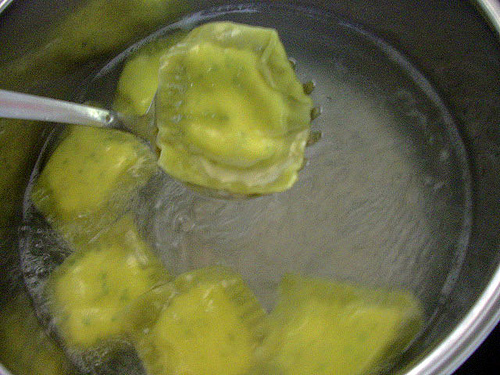 A quick one minute bath in some lightly boiling salted water, and they’re ready. These guys get sticky, so rinse them in cold water immediately, put them in a sauce immediately, or place them separate from each other. In the meantime, I had put together the sauce. 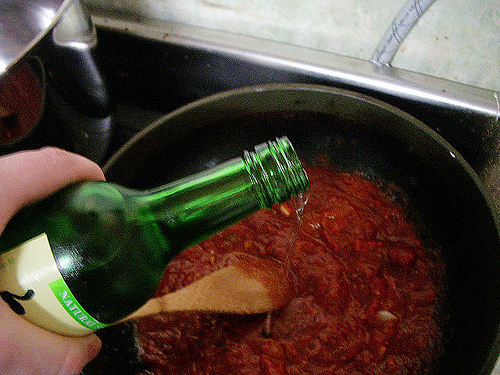 Vodka sauces are creamy, tomatoey and garlicky. 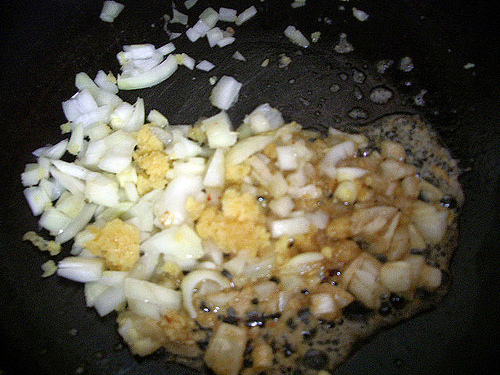 I sweated a lot of garlic in some olive oil with some chopped onions. 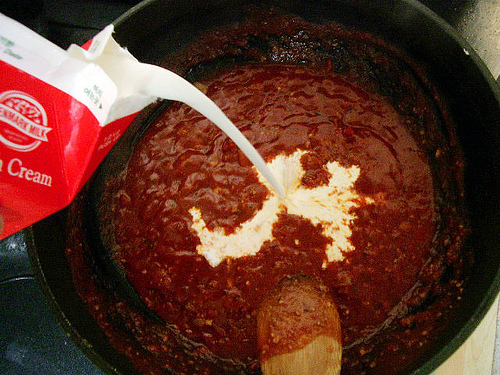 Now, you can make your own homemade tomato sauce if you want to. Me? There are some times I just cut corners. I’m just that lazy. 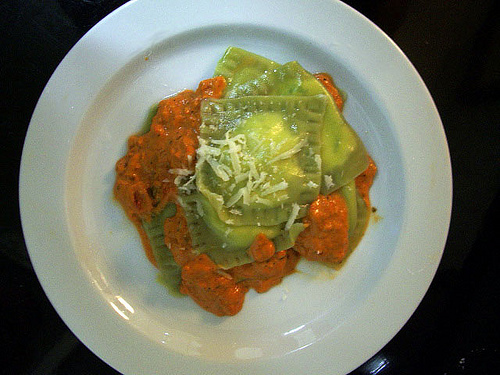 Besides, I’d already made homemade cheese and ravioli. If I can get any of those premade, I would do it quickly. But, hey, I can get spaghetti sauce at the store, so let’s save ourselves the trouble of having to make something else from scratch. I love food, but I’m not a monk. To the onions and garlic, I added a jar of spaghetti sauce along with half a bottle of soju. I let this simmer for a while–until the soju had a bit of the bite cooked out of it and had time to mingle with the sauce. I then stirred in some heavy cream until it had a bit of an orange color. I let it cook through on medium low heat for another five minutes. After garnishing with some fresh Romano cheese, I had a classic dish. 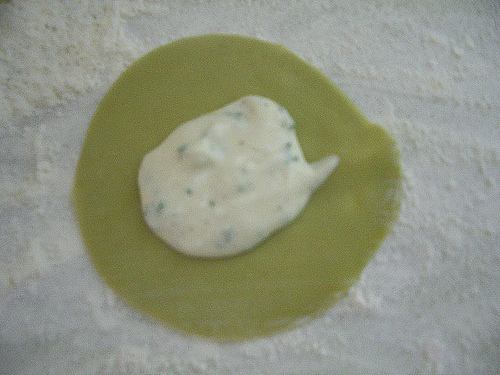 Of course, you can use the soju sauce on other pastas. Really, this one is worth it. nd how can you go wrong with half a bottle of soju and some heavy cream in the sauce? I’ll definitely give this a try. Today kevin and I went to buy soju and found out that in Washington state you have to buy soju in the liquor store! Wonder if it is a buck there. What are you talking about? I saw your Thanksgiving meal, and I regularly see the pics of your house and area on your web site. We’re living with you, if anything. I will try this recipe soon. 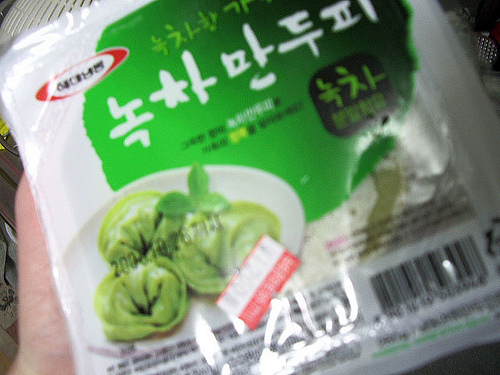 never thought Mandu-pi could be used as ravioli, beautiful! !